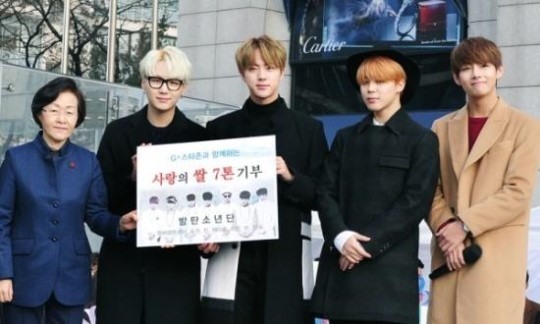 Boy group BTS donated 7,187 kg of rice for charity during an opening ceremony for K-star Road’s third construction, taking place in front of Galleria department store in Gangnam-gu, Seoul. on Monday. The donated rice was received by the group from fans at its concert held in November. Meanwhile, BTS dropped its fourth EP “The Most Beautiful Moment in Life, Part 2” on Nov. 30.